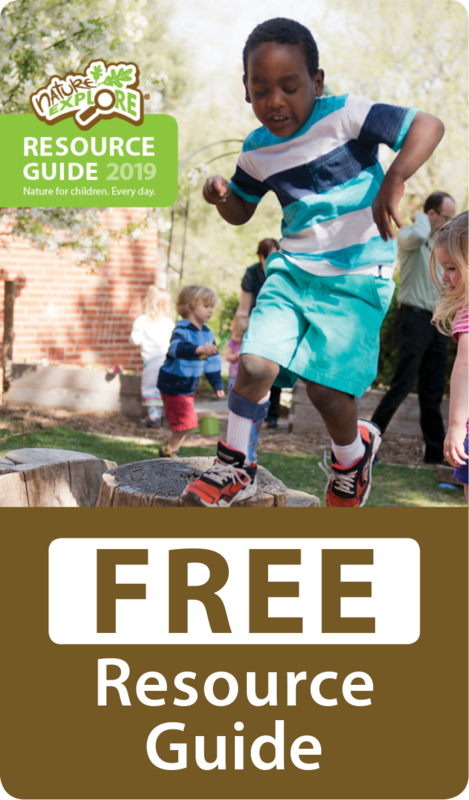 When researching new programs for Noah’s Ark Preschool to become involved in, we found the Nature Explore Program. This outdoor classroom would strongly benefit our students and coincide with the Quality Rating Scale and our belief that the playground is just as important as the rest of the classrooms. One of the most challenging but exciting parts was deciding on the layout for our outdoor classroom. 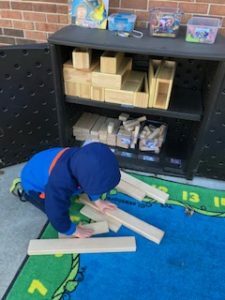 We have a very large area which allowed us to incorporate some of the equipment and furniture from our existing play area to create an exciting outdoor classroom where children can play while learning. 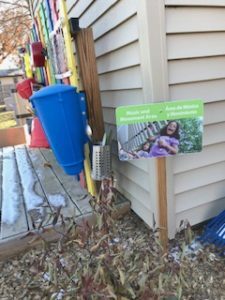 We purchased signs from the Nature Explore catalog for easy identification of – Art, Gardening, Climbing, Messy Materials, Dirt-Digging, Building, Large Motor, Music and Movement. We were fortunate to get a grant to extend our fence and add a Tricycle Track/Gathering Area. The students are benefiting from the large space and enjoy riding their tricycles during our outdoor play. 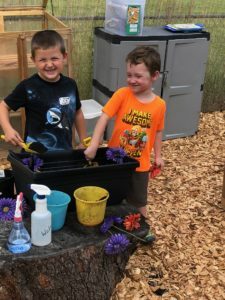 Our students thoroughly enjoy our garden area that is filled with child-friendly plants that allow them to explore the life cycle of a plant. 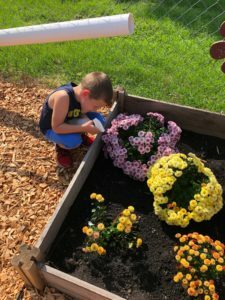 We encourage the children to explore the garden every day to see the changes to the plants and to help water and pull weeds. The Messy area is another center that has large student involvement. 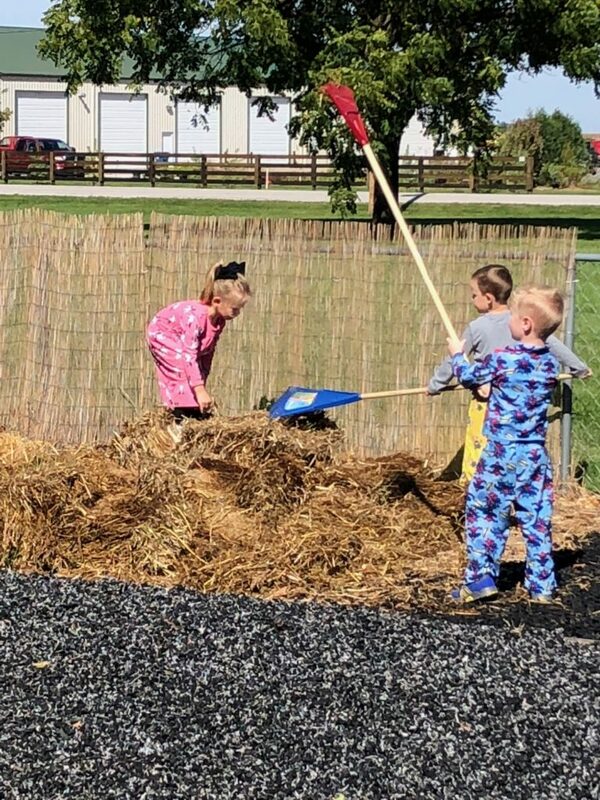 We have many farming families within our preschool who have been gracious to donate hay, wood cookies, cornstalks, soybean plants, pumpkins and gourdes to our Messy area. Our students enjoy exploring all the plants they see every day surrounding Blue Grass. 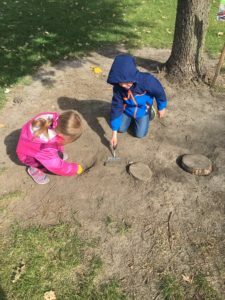 We incorporated two shade trees into our art, science and dirt-digging areas. During the fall they also add beautiful colors to our classroom. We have several flowering bushes and perennials throughout the space. Our future plan is to add more tall grasses and flowers throughout the classroom to add more color and exploration areas for our students. 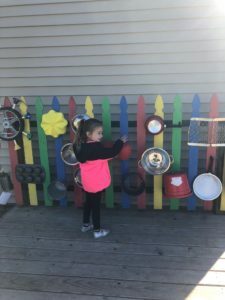 We are very proud of our outdoor space and want to thank the First Children’s Finance and Scott County Kids for the help with extending our fencing and adding our blacktop area. We would also like to thank the Blue Grass Presbyterian Church for the support in building our classroom and maintaining our space to give our students a beautiful area.